A light, easy, and healthy smoothie perfect for breakfast or snack. 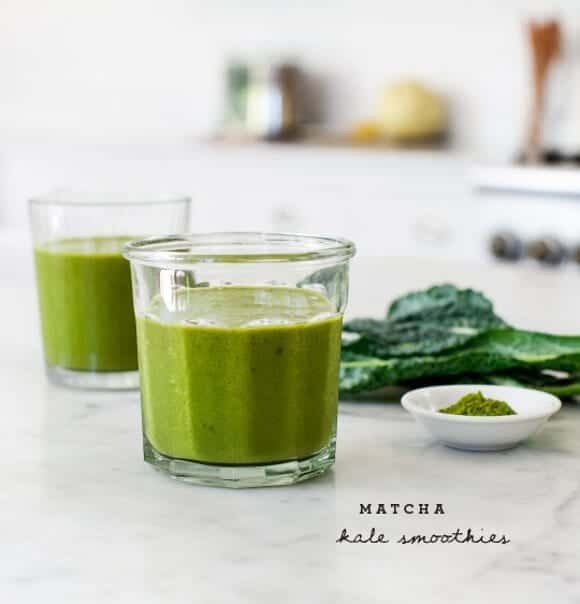 Full of banana, matcha, kale, peaches, and ginger, it's refreshing and a little sweet! Blame it on the heat, but I’ve finally joined the “smoothie for breakfast” club. I’ve always been more of a breakfast taco or avocado-toast-in-the-morning kind of person, but lately I’ve been waking up craving something a little more light and refreshing. This icy cold matcha kale smoothie really hits the spot. Matcha (to me) is as good of a pick-me-up as coffee. Plus, I was able to sneak some greens in here. The kale taste is almost barely noticeable because Jack, our resident smoothie-lover, is not exactly a green juice guy. At least, not yet. Creamy bananas and sweet ripe peaches help make this smoothie a little more, well, smooth. In the wintertime, I think I’ll try subbing in ripe pears. And I almost forgot – ginger. It’s totally optional, but it adds a nice (healthy) kick. Grate in a little fresh ginger or splash in some ginger juice. About matcha: Unlike steeped tea, matcha is made by grinding the entire tea leaf into a fine powder. Because you consume the whole leaf, it has approximately 10x more nutrients than regular green tea. (If you’re interested in more health benefits, click here). We, of course, love it because it tastes good! If you’ve never had it, this smoothie is an easy way to give it a try. Or have a look at our other Matcha Recipes. In a high-speed blender, combine all ingredients. Blend until smooth. Banana-free option: Replace the banana with ¼ cup raw soaked (then drained) cashews and extra almond milk. This recipe was developed for Aiya Matcha. perfect timing! the kale in our garden is bursting with glee!!! What a great use for Matcha. I can’t wait to try this since its so hot here and hot matcha tea just isn’t going to cut it! Mmmm tasty! I tried a new Kale smoothie recipe this morning but didn’t love it. I’ll try this one tomorrow and see how it goes. This smoothie recipe looks incredible. I’m obsessed with peaches right now. 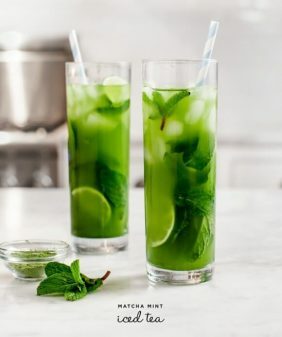 Can you use a drinking quality of matcha or is it best to stick with the stronger flavor of the cooking grade? I like the cooking grade when mixing with other ingredients – the delicate flavor of (more expensive) ceremonial matcha can get lost. With the cooking grade – you can actually taste it. Although, Aiya’s is still nicely mellow and not too strong or bitter. What an awesome idea, love everything in this smoothie!! 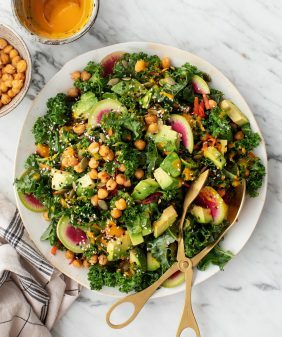 Wouldn’t have thought to include kale but sounds like a great breakfast alternative! Great suggestions for alternatives too! Ha, me too! I’ve been on a breakfast smoothie kick all week. It’s so perfect for these hot days, and it feels like such a treat. This one looks delicious. A great combination of flavors, recipe is pinned! 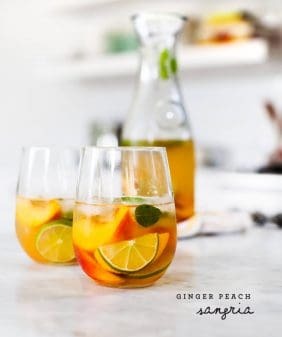 Great summer drink! thanks for sharing! 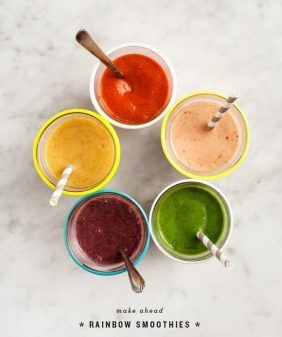 I feel the same way, I’m usually all for tacos for breakfast, but with the weather warming up I’m allll about the smoothies! This sounds amazing!!! What a great pick me up. I’ve never tried matcha but now I need to. I never knew that it had so many more benefits than loose tea. this looks rad! my boss spent 80% of her time at her previous job in hong kong and she’s gotten me hooked on matcha lattes. soooo good and i’ve been wanting to try it with some other stuff. this looks like a good place to start. This looks amazing! I love peach smoothies AND green tea but I’ve always been scared to try a green smoothie… this is clearly the time. Also, thanks for clarifying exactly what matcha is because I’ve been curious but never remembered long enough to look it up. Yum! YES! This is almost the exact breakfast smoothie I make. Like you, I’m a matcha monster. I’m going to come over for breakfast tomorrow, k? Lovely! Seriously need to re-stock my matcha supply. This looks so yummy & perfect for the heatwave here in London. I can only buy kale in bags in the store with the leaves already in small pieces. What is it equivalent to? A handful of kale??? I would definitely add the ginger. Just because I like that spice. I am not a breakfast smoothie drinker, but I sure like them any other time. I love the color. Oh, this looks amazing! Love matcha, can’t wait to try this! What a fab combination! 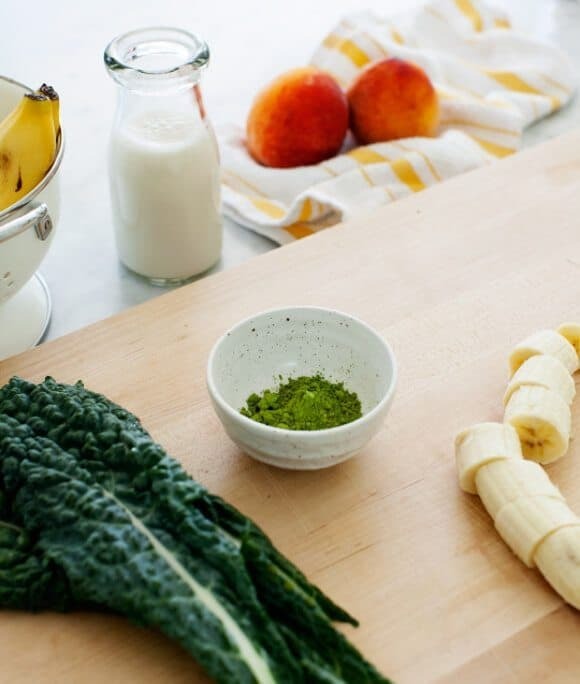 Some of my favourite ingredients – kale, matcha, peaches…mmm! Thanks for the inspiration, I have a bunch of kale in the fridge at the moment, so I think I will try it this week (with pears, as it is winter here in Australia!). 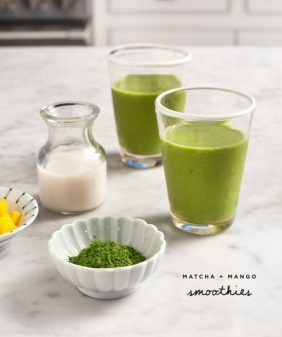 I have never tried matcha, but I’m motivated to get going on the smoothie for breakfast train. It’s the middle of summer, yet my body forgot it’s bikini season. Whoops. Love your blog, love your recipes. But, this one is not my fav. The peach didn’t cover up the kale flavor as I was hoping. 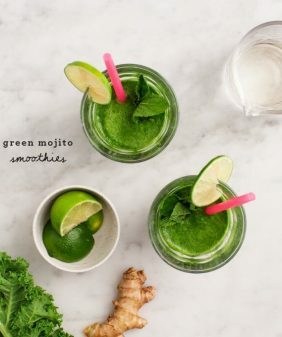 Thank you for this healthy drinking recipe. It looks very delicious. Must try at this weekend.